But I am not sure of the seasonality. I was hoping for all seasons but it looks a bit like this one might be autumn/winter. Any thoughts?? In a summer edition of "nanaoh" I have seen a list of patterns for summer and among other motifs: goldfish, kingfisher, ajisai, ships, uchiwa, there was also bamboo. I think its an all year round motif. It is difficult to judge from a picture, but I agree with stepan san you can wear this obi during the whole awase season. About seasonality. I was quite surprised to see a lined haori with shell pattern. So things are not written in stone. 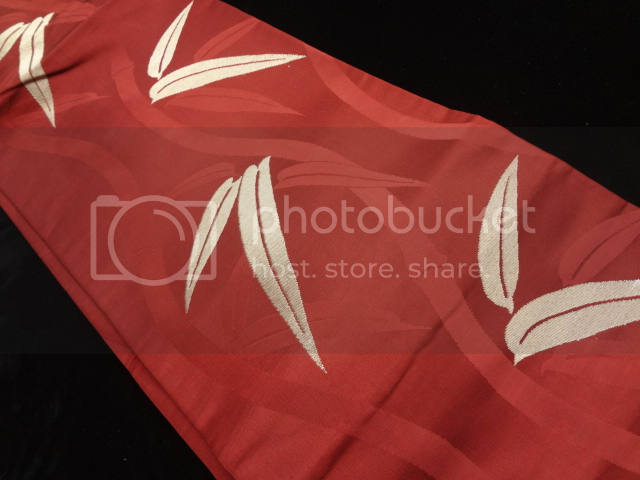 I have a couple of bamboo patterned summer kimono, I suppose it depends on the weave. This obi looks quite thick, lined, and it rich in colour so I'd lean towards the colder months - but I wouldn't worry too much, if you love it! It seems to me that the bamboo is shaped into a tatewaku pattern. Tatewaku can represent steam, presumably from oncoming warm spring temperatures and so could be considered a spring motif. Since your obi is lined and such a rich red, and the pattern hints at spring, I propose that it would be suitable for mid-to-late winter.